I just heard a television report that January 25 is considered the most depressing day of the year. It's also my wife's birthday and she can attest to that. But there's an upside, the worst of winter is over. The report prompted me to look at some of my photos from my Michigan travel book, Michigan: An Explorer's guide, and I found one that reminds us that better weather is in store for us. 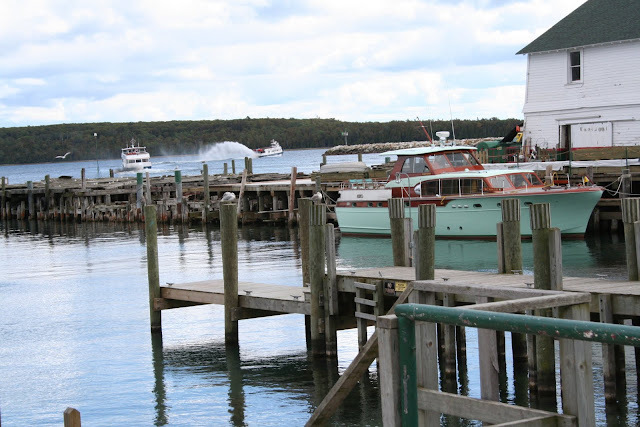 It's a photo of the Mackinac Island boat dock. By the way, the TV report said that June 25 is considered the best day of the year. It's time to make plans for how to spend it. Beautiful photo. I thought it looked like a place I'd seen near Ludington. Boy, was I off! I think I'll just go ahead and make plans for June 25 now. Thanks for the prompt!